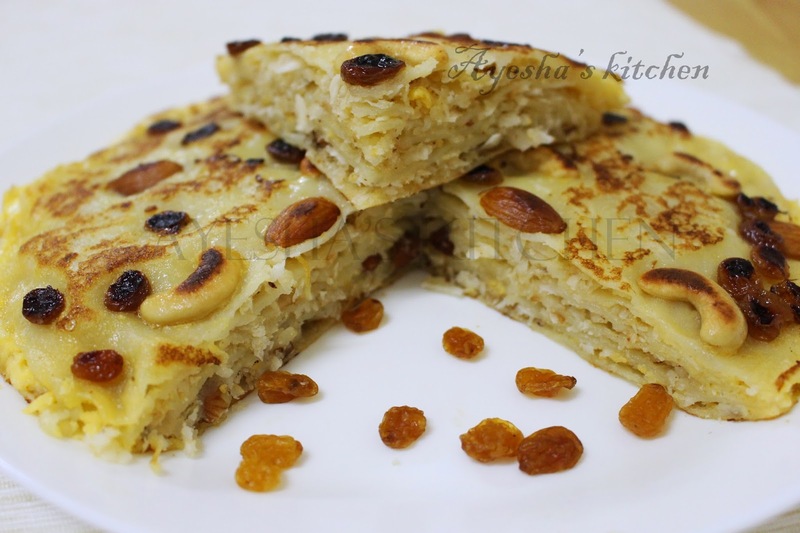 An all-time favorite nostalgic snacks recipes which can be made in two versions, Sweet and savory...This snack is named as Chattipathiri / Athishaya pathil. 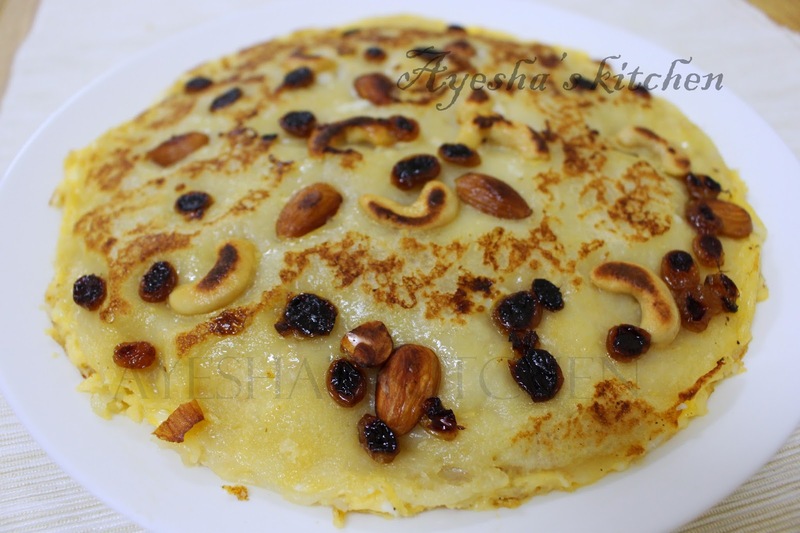 A very famous and traditional Kerala recipe which is very popular in Malabar region. An easy snack recipe for parties as it feeds a crowd. One of the best snack ideas for kids as they love those pretty layers stuffed with sweet coconut fillings. So just try this tasty snack. Mix the flour ( maida ) with hot water and salt. Make a dough using 1 tbsp ghee. ( OR u can put flour, salt and some water in a grinder and grind finely like dosa batter. If so, make some big thin dosa with this batter and keep it aside). Let the chapatti dough rest for half an hour. Now make some( 5 - 6 nos...or more )thin pancakes /chapatti with the dough and cook them in a tawa lightly. Keep it aside closed. ( if it is not closed, the chapatti will become hard). Heat ghee in a pan and roast cashews, almonds for decoration. Keep it aside. Now dry roast grated coconut, chopped nuts, and sugar for few minutes. Beat two eggs and add it to the roasted coconut and then scramble it well till done. Add sugar according to your taste. Now the sweet filling is ready. Keep it aside. Beat the eggs with milk, sugar and a pinch salt. Heat a pan and when hot apply some ghee. Now dip the half-cooked pancake /chappatti in this egg batter and layer it on the hot frypan. Sprinkle some sweet coconut fillings over the first layer. 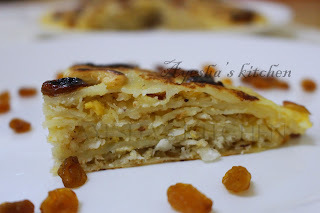 Again take another pancake /chapatti , dip in egg batter and then again sprinkle some sweet mixture over it. Continue this process till all pancakes /pathiri get placed over the other. Finally, pancake / Pathiri must be on the top. Garnish with roasted nuts or raisins and pour the remaining egg batter over the pancake /pathiri and its edges and just press all the edges carefully. Now make the flame to medium and cook with lid closed for 10 minutes. Flip the other side and cook for other 10 minutes. (this process can be done by flipping to another hot fry pan). Once cooled cut into desired shapes.